Chicago Mayor Rahm Emanuel announced Tuesday morning that he will not seek a third term as mayor. RELATED: Mayor Emanuel Won’t Run for Re-election. What That Means for Candidates. Cook County Board President Toni Preckwinkle said she was surprised by Emanuel’s announcement and thanked him for his years spent in public service. “Being mayor of the nation’s third-largest city is extraordinarily difficult and all-consuming. I wish him and Amy well in their future endeavors,” Preckwinkle said in a statement. During his tenure as mayor, Emanuel also faced a seven-day strike by the Chicago Teachers Union in 2012 and oversaw the closing of more than 50 schools across the city. Sharkey cited school closures, special education budget cuts, declining CPS enrollment and the lack of an elected school board among Emanuel’s policies the union has opposed. Mayor Rahm Emanuel appears on “Chicago Tonight” on June 28, 2018. 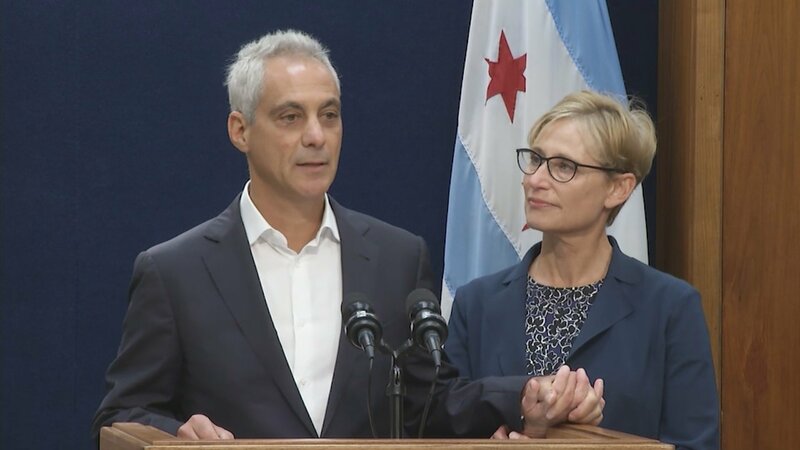 Prior to serving two terms as mayor of Chicago, Emanuel was White House chief of staff to President Barack Obama, who called Emanuel a “tireless and brilliant public servant” in a statement. Emanuel also served three terms in the U.S. House of Representatives for Illinois’s 5th District and served in President Bill Clinton’s administration. In a statement, Illinois House Speaker Michael Madigan thanked Emanuel for his public service: “Mayor Emanuel offered steady leadership through difficult times. His efforts to balance the budget, stabilize pensions, and make tough decisions consistently reflected his commitment to do what was best for the future of our city, not what was easy. As Chicago continues to move forward and grow as an international city, we will remain grateful for Mayor Emanuel’s leadership,” Madigan said. While Emanuel will no longer serve as mayor, he says he will “always be here for the future of this city” as a citizen. “I hope I’ll find ways to answer the call I’ve asked of every citizen: to do my part to stand up for the next generation, who deserve the doors of opportunity to be open and the spark of hope to light their eyes,” he said. Join us Tuesday for full coverage of this story, including reaction from Chicago mayoral candidates, reporters, community members and aldermen.